The SMTP_OUT_SERVER parameter is set correctly, and potentially the email server is configured to permit receiving SMTP emails from the Oracle Database server. The utlmail.sql and prvtmail.plb scripts (found in the rdbms/admin directory of the Oracle home) are executed to create the UTL_MAIL package components in the database. The Oracle user account that will access the UTL_MAIL package’s procedures has sufficient access permissions for the package. A couple of years ago I wrote an article that showed how to schedule the periodic sending of an email using UTL_MAIL – that article might also be of interest if you find this article helpful. strSQL = strSQL & "  '" & strMessage & "')"
Looks to be very simple, right? But wait, maybe it would be better that the call to UTL_MAIL use bind variables, rather than literals, to not only save some space in the library cache, but also to make it a bit more difficult for the DBA to read sent emails from Oracle Database’s various V$ views, and to make it easier to include apostrophes (single quotes), line breaks, and other email formatting commands in the email message. strSQL = strSQL & "  ? )" Well, that was easy, when executed, the code results in an error message that reads: “Unspecified Error“! Fine, don’t tell me what is wrong… I will just search the Internet for the answer. strSQL = strSQL & "  :message )"
Well, that was easy, resulting in an error message that reads: “Unspecified Error“! Fine, don’t tell me what is wrong, I will just guess. Oh, a book recommended putting “Begin ” before the UTL_MAIL in the SQL statement, and “; END;” just after the “)” in the SQL statement. “Unspecified Error“! 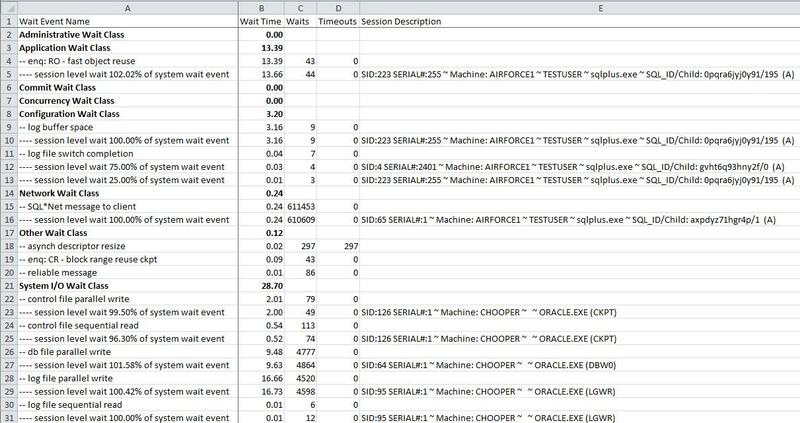 10046 trace at level 12 to see what Oracle Database rejected? Sorry, no SQL statements that were attempted to be directly executed by the application appeared in the trace file. Well that was easy, although it might seem a little confusing not being permitted to specify essentially the same (literal) SQL statement as was used originally, just with bind variable placeholders when calling UTL_MAIL procedures. Then, all that we need to do is execute the saved plain text file using either the cscript or wscript command from the Windows command line. A year older, any wiser? It has been roughly five months since the last installment in this blog article series. Hopefully, several people have found this series helpful and have adapted the solution to better fit their specific needs. 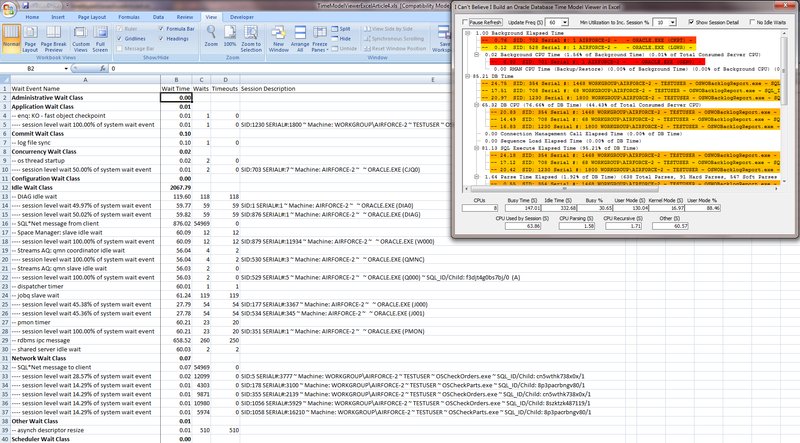 By the end of the last article the Excel based application not only displayed time model data at the system-wide and session-level, but also operating system statistics (from V$OSSTAT), system-wide and session level wait events, various other statistics (from V$SYSSTAT), execution plans, and also allowed enabling/disabling 10046 extended SQL traces. A lot of features, but what else may be added to the project? 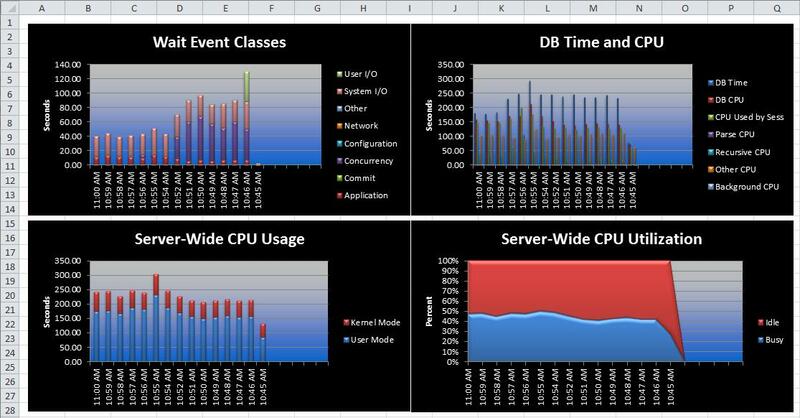 Sheets("Statistics").Cells(1, 9).Value = "System I/O"
Sheets("Statistics").Cells(1, 10).Value = "User I/O"
.Chart.ChartTitle.Text = "Wait Event Classes"
.Chart.ChartTitle.Text = "DB Time and CPU"
.Chart.ChartTitle.Text = "Server-Wide CPU Usage"
.Chart.ChartTitle.Text = "Server-Wide CPU Utilization"
Me.Caption = "Charles Hooper's Time Model Viewer in Microsoft Excel"
One of the advantages of using Excel for the charts is that the charts automatically update as new data is added to the Statistics worksheet. Unfortunately, the data series range for the chart is also auto-modified every time a new row is inserted into the Statistics worksheet, such that the charts never actually show any information. To avoid this situation, the above code does not perform a row insert, rather it copies the existing data and pastes that data one row down in the worksheet. The chart formatting shown above is quite fancy – so fancy that it requires Microsoft Excel 2007 or later. The chart creation code may be altered to create the typical flat single color chart elements found in Excel 2003 and earlier. Are we done yet? Part 7 of this blog article series is still a very rough sketch. Any ideas for improvement? In part 1 of this series the challenge was to simply reverse the order of digits in the numbers from 1 to 1,000,000 to find that cases where the numbers formed by the reverse ordered digits evenly divided into the original number. In part 2 of this series the challenge required examining all of the numbers between 1000 and 9999, where arranging the digits of the original number into any of 23 valid combinations resulted in a new number that cleanly divided into the original four digit number. There were several different solutions provided to the two challenges, so now it is time to move on to part three of the series. 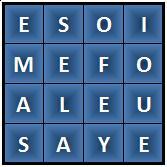 One of the rules of the game requires that words must be at least 3 letters in length, for example: you say melee eye (I) see elfs file some mail (OK, the word I is too short, but we can have some fun with the words that are found). As you might be able to guess, there are a lot of possible combinations of the 16 letters found on the dice, some of which are valid words. If we just consider the 5 letter, 4 letter, and 3 letter combinations of the dice, there are more than a half million possible combinations (in the following table, multiply the numbers across and add the results for each row) – no wonder I needed the computer’s help with these puzzles. 16 15 14 13 12 = 16! / 11! 16 15 14 13 = 16! / 12! 16 15 14 = 16! / 13! Part 1: Consider the 2 x 2 letter arrangement at the left. With the help of Oracle Database, list all of the three letter combinations of those four letters. There will be 4 * 3 * 2 = 24 possible combinations of the letters. Part 2: Consider the 4 x 4 letter arrangement at the left. 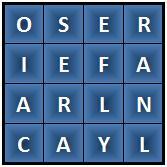 With the help of Oracle Database, list all of the four letter combinations of those 16 letters. There will be 16 * 15 * 14 * 13 = 43,680 possible combinations of the letters. Part 3: Consider the 4 x 4 letter arrangement above. With the help of Oracle Database, list all of the three, four, five, and six letter combinations of those 16 letters. If you see any seven letter words in the above set of letters, you might as well retrieve those letter combinations also. How many letter combinations do you have in total for part 3? Part 4: Extra Credit: How many of the letter combinations generated in part 3 above are valid U.S. or U.K. English words? List the words. Part 5: Extra, Extra Credit: List any words found in the letters at the left that have any connection to Oracle Corporation. Remember that a letter can only be used as many times in a single word as it appears at the left (if you can form a word with three letter A’s that have a connection to Oracle Corp., go for it.). When I put together this challenge I did not think that it was possible to complete Part 4 Extra Credit using just SQL. I was fairly certain that there were some interesting techniques to retrieve HTML content with the help of PL/SQL, but I had not worked out a solution that utilized that technique. As I write this, Radoslav Golian in the comments section appears to have both a PL/SQL and a SQL solution that uses the dictionary.reference.com website to validate the words (only 6 words to avoid a denial of service type attack on the dictionary.reference.com website). One of the approaches that I considered, but did not develop, is something similar to how Radoslav verified the words, but I would use a VBS script to submit the request and check the result as is demonstrated in these two articles: Submit Input to an ASP Web Page and Retrieve the Result using VBS and Use VBS to Search for Oracle Books using Google’s Book Library. The Excel macro builds letter combinations that are between the minimum and maximum length, and then tests those letter combinations using the built-in dictionary that is in Excel. I had a little bit of difficulty coming up with a way to generate the letter combinations of variable length, so I settled on a custom developed technique – I would simply keep track of the original character positions, manipulate those original character positions, and then output the corresponding characters. The challenge is then how does one verify that the same character position is not used more than once in a single word? Increment the number in a position, and if that number does not appear in a position to the left, move one position to the right. When the maximum character number (16 in this example) is exceeded in a position, reset the number to 1, move one position to the left, and increment the value in the new position by 1. In the last position the character number should be incremented as many times as necessary to reach the maximum character number – each time a potential new combination will be generated. But there is a problem with this approach – it does not use Oracle Database! Remember that there are more than a half million character combinations for just the 3, 4, and 5 letter combinations – the above will as for 6,336,960 letter combinations to be generated. But there is a problem with this approach – it does not verify that the letter combinations are actual words! 8 16 15 14 13 12 11 10 9 518,918,400 = 16! / 8! 7 16 15 14 13 12 11 10 57,657,600 = 16! / 9! 6 16 15 14 13 12 11 5,765,760 = 16! / 10! 5 16 15 14 13 12 524,160 = 16! / 11! 4 16 15 14 13 43,680 = 16! / 12! 3 16 15 14 3,360 = 16! / 13! That is more than a half billion combinations! 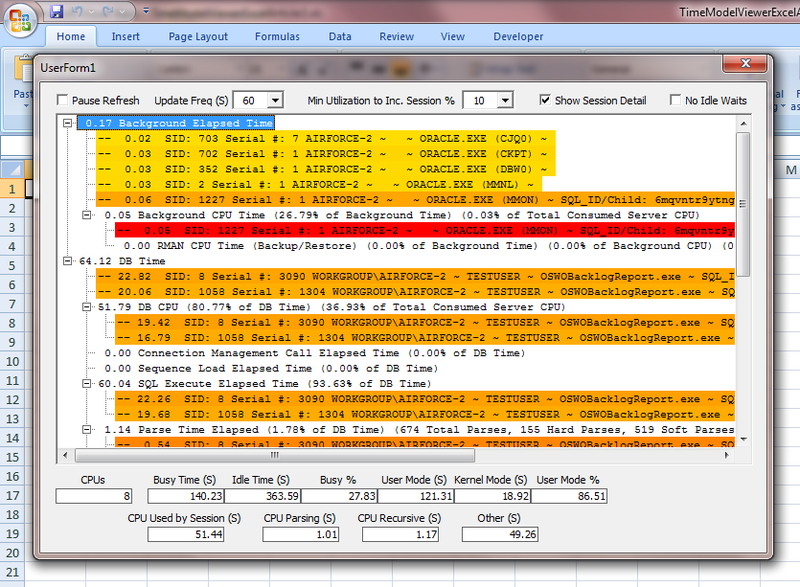 Warning, significant database server CPU consumption will result when generating all combinations. dbDatabase.ConnectionString = "Provider=OraOLEDB.Oracle;Data Source=" & strDatabase & ";User ID=" & strUsername & ";Password=" & strPassword & ";FetchSize=5000;"
strSQL = strSQL & "  1"
The words found appear to depend on the version of Excel – Excel 2010 seems to find more words than Excel 2007. Excel found Ellison in the second word list. For Part 5 Extra, Extra Credit, what other words connected to Oracle Corporation were found? Next, we need to add a little more code to the Initialize event of the UserForm to add the SQL statements that will allow the CommandButtons to function. Double-click in the background area of the UserForm to display the Initialize event code for the UserForm. strSQL = "SELECT * FROM TABLE(DBMS_XPLAN.DISPLAY_CURSOR( ?, ?, 'TYPICAL +PEEKED_BINDS'))"
strSQL = strSQL & "  AND PLAN_HASH_VALUE= ?" In the above, you might have noticed that I neglected to set up the two bind variables for the comTrace object (an object of type ADODB.Command), while I did set up the two bind variables for the comXPLAN object. The reason for this omission is that in previous testing I simply could not make the SQL code execute with bind variables, so I cheated a bit, and will simply replace the CommandText property value for the comTrace object with hardcoded values for the session’s SID and SERIAL# when the cmdTraceSession CommandButton is clicked. strSQL = "DBMS_MONITOR.SESSION_TRACE_ENABLE(" & Format(lngSID(intCurrentSessionIndex)) & "," & Format(lngSerial(intCurrentSessionIndex)) & " ,TRUE,TRUE)"
The first of the above sections creates the definition of the object type TraceDefinition which is simply composed of seven variables. The second section (beginning with the word Dim) creates an array of 1,000 (actually 1,001) objects of type TraceDefinition. 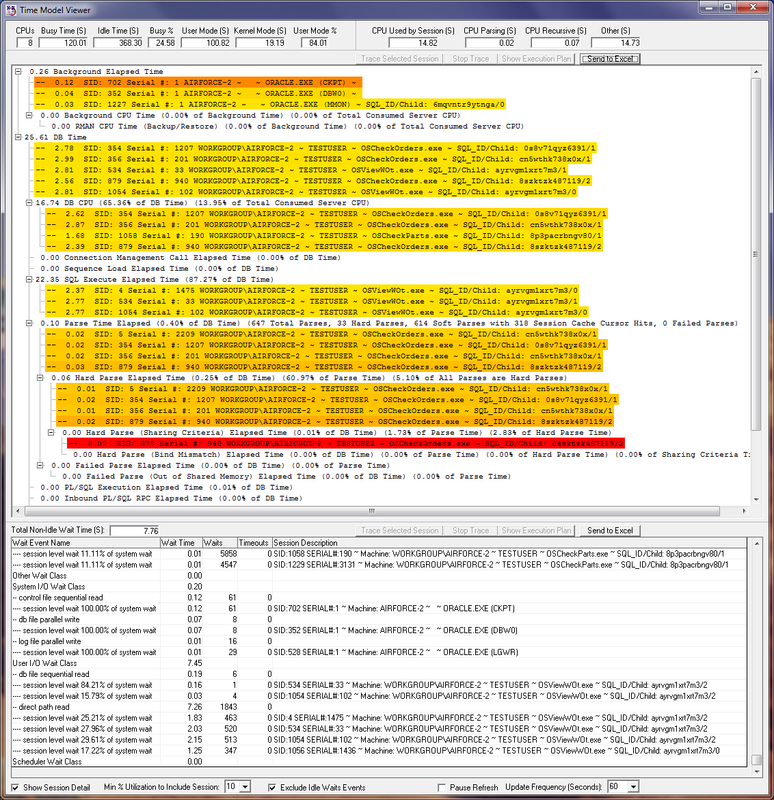 strSQL = "DBMS_MONITOR.SESSION_TRACE_DISABLE(" & Format(lngSID(intCurrentSessionIndex)) & "," & Format(lngSerial(intCurrentSessionIndex)) & ")"
You might notice that the code to stop the trace for a session is very similar to the code to start the trace. strOut = strOut & "  VARCHAR2"
strOut = strOut & "  NUMBER"
strOut = strOut & "  LONG"
strOut = strOut & "  ROWID"
strOut = strOut & "  DATE"
strOut = strOut & "  RAW"
strOut = strOut & "  LONG RAW"
strOut = strOut & "  CHAR"
strOut = strOut & "  CLOB"
strOut = strOut & "  BLOB"
strOut = strOut & "  BFILE"
Note that in the above code, if you are running Windows Vista or Window 7 with User Access Control enabled, you will need to replace all instances of C:\ExcelTimeModelViewer in the code with a writeable file location. If you examine the above, you will notice that the output from V$SQLSTATS is identical for both of the child cursors – that is because the PLAN_HASH_VALUE is identical for both of the child cursors. Where do we head next with the project? I am a person who prefers looking at raw numbers, but maybe someone reading this blog prefers pictures? We still need to add the wait events to the project. While we could display the wait events information in a TreeView control, there would not be much sense to display the wait event information in a grid type control when we are able to just push that information out to a worksheet in the Excel workbook. So that we are able to control which worksheet that information will be push to, we should begin by naming the worksheet. 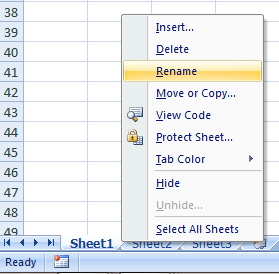 In the main Excel window, right-click Sheet1 and select Rename. Change the name to Wait Events. Note in the above code the snpDataWait.Close command that is below the Loop and above the End If lines. That command closes the snpDataWait recordset, which is necessary to prevent cursor leaks. Review the other code sections that are in the ReadData subroutine and verify that the recordset is always closed between the Loop and End If lines, and if it is not, fix that problem (hint: there is at least one code section that needs to be corrected). Sheets("Wait Events").Cells(lngRow, 1).Value = "Wait Event Name"
Sheets("Wait Events").Cells(lngRow, 2).Value = "Wait Time"
Sheets("Wait Events").Cells(lngRow, 3).Value = "Waits"
Sheets("Wait Events").Cells(lngRow, 4).Value = "Timeouts"
Sheets("Wait Events").Cells(lngRow, 5).Value = "Session Description"
Sheets("Wait Events").Cells(lngRow, 1).Value = strLastWaitClass & " Wait Class"
Sheets("Wait Events").Cells(lngRow, 5).Value = ""
Sheets("Wait Events").Cells(lngRow, 1).Value = "---- session level wait " & Format((CDbl(snpSessionWait("time_waited")) - dblSessionWaitValue(j, intSessionCurrent)) / (dblWaitValue(j) - dblWaitValueLast(j)), "0.00%") & " of system wait event"
strOut = strOut & " ~ SQL_ID/Child: " & snpSessionWait("sql_id") & "/" & Format(snpSessionWait("sql_child_number"), "0") & " "
strOut = strOut & " (A)"
When the single quote is removed, the text color should change from green to black. 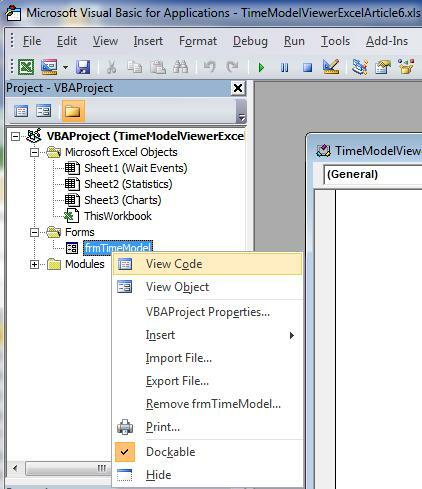 In the previous articles of this series we started building a solution in Microsoft Excel that duplicates some of the functionality in one of my programs – the Oracle Database Time Model viewer. So far, the project only works at just the system-wide level. Hopefully, not too many people are having difficulty following along with this article series – it has been more than a decade since I professionally taught programming and Microsoft Excel, so I might be overlooking a couple of “obviously” difficult points. If you have not done so yet, you may need to change Excel’s default behavior when an error occurs in the code, since some errors are expected and should be handled appropriately within our programming code. 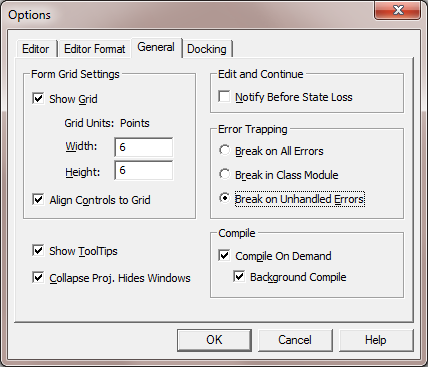 To check the error trapping setting in the Excel code editor window, select from the menu Tools – Options. 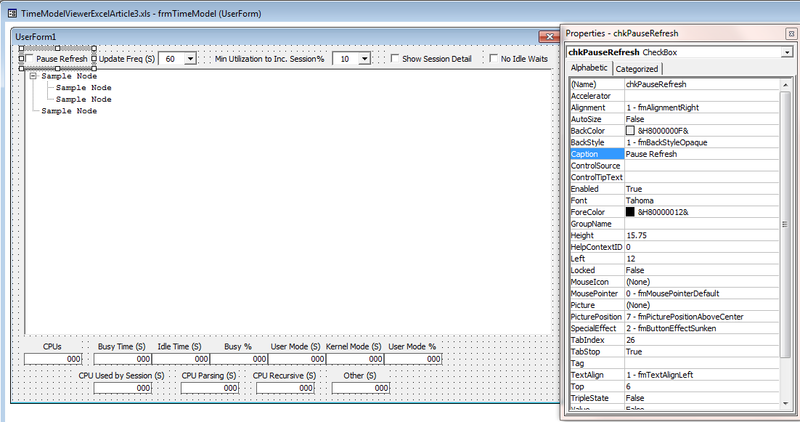 On the General tab, find and select the setting Break on Unhandled Errors, then click the OK button. If you plan to do much programming in Excel, I also suggest setting the Require Variable Declaration option on the Editor tab – setting that option helps to avoid some forms of typing errors (all used variables must be officially declared before use). If you find that the macro seems to pause unexpectedly when first started, there is a simple solution for that issue, and we will apply the simple solution later in this article. The chkDisplaySessionDetail CheckBox technically does not require any special programming code in its Click event, so we will come back to this program functionality later. By looking at the above screen capture it is probably obvious that those sessions which had consumed a small percentage of a Time Model Statistic are displayed with a yellow background, those sessions that had consumed 50% of a Time Model Statistic are displayed with a deep orange background, and sessions that had consumed 100% of a Time Model Statistic are displayed with a solid red background. We still have a bit more to add to this tool, so keep an eye open for the next article in this series.